Whenever we keep a check on our wardrobe, we find one or two long kurtis for sure. A long kurti isn’t just a staple, it’s a saviour! It comes handy on those days when we want to style ourselves comfortably. It comes into mind all of a sudden, when the killer fitting top and jeans are no more a flattering thing! A kurti truly rescues us whenever we need something comfortable yet stylish to wear. Here we have rounded off 7 stylish ways to wear long kurtis this season! Yes, you can tickle everyone’s heart with your desi chic look. Let’s find out those ways! From reel to real life, palazzo pants have a long list of fan-following. The playfulness of an easy-breezy palazzo pant becomes a treat to the eyes when blended with a kurti! Even Bollywood hotties are finding these bottoms perfect to be worn with staples like long kurtis! The urbane and the ethnic combination that one gets after teaming a kurt with palazzo is outstanding. It is also a great way to create a refreshing Indo-western look! In order to look dapper for your workplace, wear a solid colouredkurti over a printed palazzo or vice versa. You can rock the party as well with embroidered or embellished palazzo kurti combination! Want to dress uniquely but gracefully for an upcoming wedding event? If yes, be prepared to garner compliments from all sides by wearing your long kurti over a skirt! This look is in trend. In fact, women of all ages are going gaga over this urbane yet ethnic look perfect to be flaunted on an occasion like a wedding. Whether you want a simple lehenga style or a luxurious lehenga style depends on the type of skirt you choose to club your long kurta with. We would suggest wearing Punjabi jutti and statement jewellery to finish off your look. Slipping into a pair of cigarette pants is one of the most popular ways of styling long kurtis this season! the cigarette pants are very much in vogue these days. 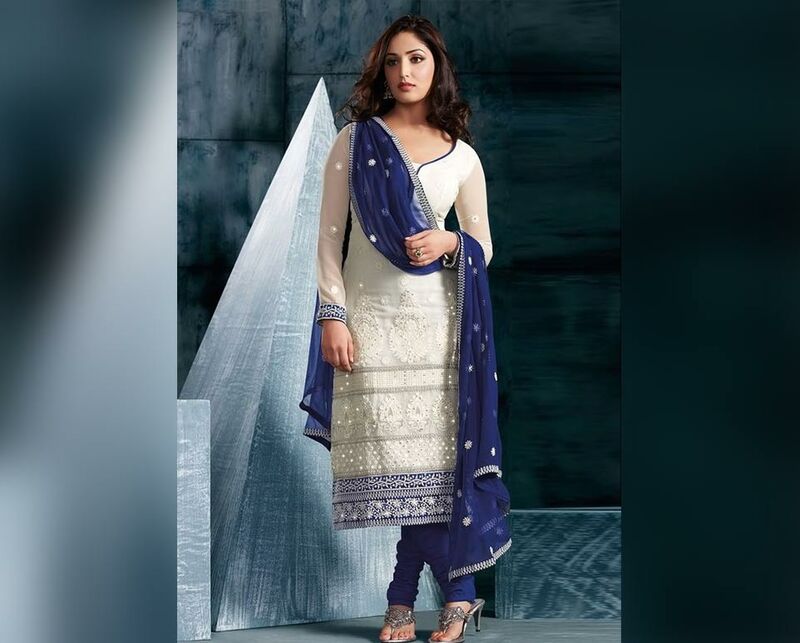 From simple to luxurious, you can find them in different fabrics to suit your kurti. Ethnicity coupled with smartness, that’s what you get when you pair your long straight kurti with cigarette pants. Believe it or not, but Anushka Sharma’s look in the Breakup Song of ‘Ae Dil Hai Mushkil’ has given we girls, a serious fashion goal, isn’t it? The hot red long kurta worn over the rolled up skinny jeans, GOSH that tickled everyone’s heart! You can get that look too by choosing a skinny jean as a bottom wear. 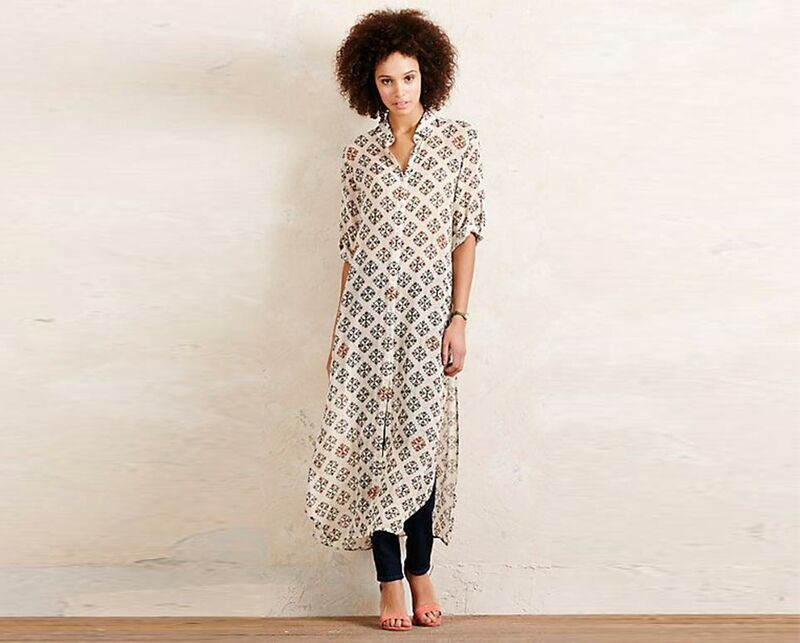 The latest designer kurtis, which are in-trend can easily be paired with skinny denim for an ultra-modern look. Make sure to finish off your overall look with a swap of kohl or just a dab of mascara on your eyelashes. OH BOY, you will wow everyone around for sure! Long kurtis and leggings, these two are killer combinations! Leggings have surfaced as the most comfortable bottom wear in a woman’s wardrobe. No matter where would you want to go, just slip into long kurti over leggings and you are good to go! In fact, today’s latest designer anarkali suits which are yet another example of long or floor-length kurtis come with shimmering leggings to match the mood and occasion both. A jacket over a solid coloured long kurti has become an evolving trend right now. The ethnic outfit is fit for women of all ages. From college-goers to party animals and professionals, almost everyone is enjoying this mixing and matching trend! Choose the jacket of any length, of any pattern from simple to embellished and there you go rocking every look like a pro! How about turning your kurti into a pretty dress? Yeah, we are serious! Styling a kurti like a dress is a novel idea which is picking up its pace with each passing day! Be it an A-line kurti or an anarkalikurti, you can style it like a dress with a bit of consideration! Pair it up with a funky yet fancy belt, a pair of sneakers and you are ready to stun people with your Indo-chic look! No matter which kurti you choose long or short, A-line or anarkali, it’s the best time to style it in a quirky way! So, girls try out above ideas and WOW others with your refreshing look! Working as a blogger in TrendyBharat- a one-stop shop for all your fashion needs. Loves to travel around, a foodie and fun-loving person. I really like your article. Well, normal people can afford and wear such outfits. These outfits are cool and amazing.